Some of the the brightest minds in science met in a rooftop tent last week due to Queenstown’s lack of conference spaces. 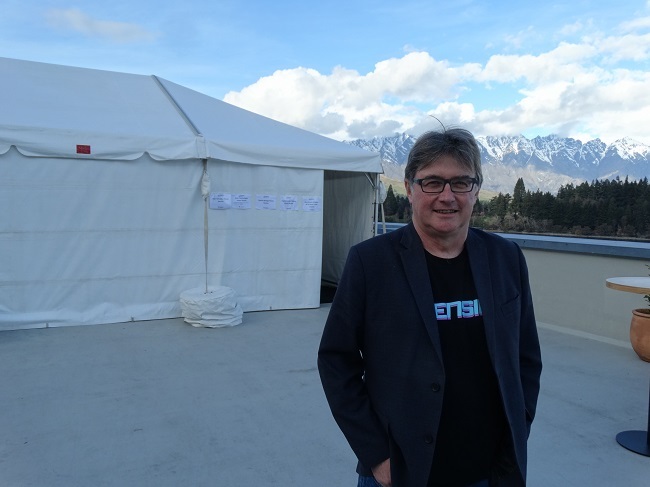 A small marquee on the roof of Rydges Lakeland Resort hotel was used to host some of the meetings and presentations during Queenstown Research Week (QRW), from August 25 to last Friday. QRW coordinator Peter Shepherd says that “really showed how stretched facilities are”. “Sometimes it’s stressful enough just getting things to work with the limitations we have here. “There’s always another global financial crisis around the corner. This year’s event attracted about 1700 registrations – up from just 100 when Shepherd began coordinating the event 15 years ago. He regularly bemoans the lack of a conference centre in Queenstown. Amway China officials were singing from the same hymn sheet earlier this year. They brought 6000 of the multi-level marketers’ best sellers on an incentive trip in April and May, in 11 waves. Those delegates were hosted in a temporary marquee at Coronet Peak ski area. Queenstown’s last council controversially investigated building a $60-million plus facility at its Lakeview site, but couldn’t get external funding. Remarkables Park developer Porter Group plans to build a privately-funded centre in Frankton. Shepherd says ultimately it’s “up to the people of Queens-town” to get a convention centre built here. Destination Queenstown’s temporary boss Kiran Nambiar reiterates the town’s “missing out on tens of millions of dollars’ worth of conference business”. Larger facilities are needed to attract other conferences as big as QRC. The tent was used for about two hours a day during the conference week with the majority of sessions held in the hotel itself.